An Old School Dogfight is a type of close-combat battle between fighter craft where each attempts to maneuver behind the other in order to shoot them down. In essence, it's a three dimensional version of Chasing Your Tail, where both parties are armed with a Fixed Forward-Facing Weapon, making it necessary to be behind their target in order to attack. In Real Life, this form of combat is limited to fighter planes, but fiction is less restricted — it can show up not only with Cool Planes, but Space Fighters, submarines, and even tunneling vehicles like Drill Tanks. Any time a 3-D environment or 2-D Space is combined with Fixed Forward Facing Weapons, you can expect to run into old school dogfighting. The reason it's called an "old school" dogfight is because it doesn't actually happen very often in real life anymore. While it was the standard form of air-to-air combat for decades, the introduction of reliable, long range guided missiles means that most modern air combat is now fought well beyond visual range. Old school dogfights can still involve the use of missiles, though — they'll just be much shorter ranged than their real life equivalent, and have to be fired from behind in order to have a chance of hitting.note This was Truth in Television for certain types of missiles, but isn't anymore. However dogfights are cool. Shooting missiles at targets hundreds of kilometers away isn't. Hence this trope. The characters involved in an Old-School Dogfight will frequently be Ace Pilots with Improbable Piloting Skills, often have a Wingman and/or a Guy in Back, and will probably cover each other's six at some point. Old school dogfighting during an Airstrike Impossible is not out of the question. Overlaps with Space Is Air when done by Space Fighters. Also see Standard Starship Scuffle, when it's the bigger spaceships duking it out. Cowboy Bebop features old school dogfighting in several episodes, as well as the movie. The series normally featured realistic space flight, but used this trope during space combat because it's cooler. Mazinger Z and its sequels -Great Mazinger and UFO Robo Grendizer- featured this kind of fighting with giant robots, although Kouji also used his mini-ship to try to take some Robeasts down, placing behind them and shooting his missiles. His first real aerial battle -in episode 34- consisted entirely of him and Genocyder F9 dog-fighting. Fighters in Space Battleship Yamato use tactics identical to World War II-era carrier aircraft, including dive bombers and torpedo bombers. Very much a part of the stylistic "feel" of the show, with the very first episode (heavily edited when it first aired in the US) even including the original WWII battle where the Yamato got sunk (by air attack) to illustrate the point. Macross combines this with Transforming Mecha, leading to some very creative maneuvers involving partial transformations. Valkyries normally use missiles — lots and lots of missiles — leading the series to also be known for the "Itano Circus" (after animator Ichiro Itano), a stylized depiction of close-range dogfighting that includes the use of missiles. Macross Frontier actually plays it straight, subverts it, and inverts it at some points. Most of the time it's played straight as it is in the other series, with two notable exceptions. First, the Ghost V-9s behave very much like they're in space, changing direction with zigs and zags, which is where it's subverted (since everything else up to that point played it straight). Second, earlier in the series, Brera dodges a gun burst from Alto by zagging sideways in an atmosphere, giving the appearance of actually inverting the trope. At the end of Pouvoirpoint, the large starship Entreprise-2061 is assaulted by a small coastguard fighter, faster and better armed, which turns around him and hassles him like an annoying biplane around a zeppelin. Enemy Ace is a great example since it takes place during WWI, and the "War in Heaven" series takes place during WWII. Evangelion 303: This story featured several dog fights -in chapter 2, 5 and 15- betweeen Asuka and other pilots flying advanced war planes. They were training duels, though. The Lost in Space movie opened with a classic space dogfight. Star Wars was the Trope Codifier for space fighters behaving this way, to the point where Luke's experience flying a skyhopper (a mostly atmospheric ship, though capable of suborbital travel) helps him fly an X-Wing. Lucas even used old movies to choreograph the space battles. The Death Star assault scene in A New Hope was modeled after the film The Dam Busters (1955). In addition, the sequence was partially inspired by the climax of the film 633 Squadron (1964) in which RAF Mosquitos attack a German heavy water plant. Clips from both films were included in Lucas's temporary dogfight footage version of the sequence. TRON: Legacy has one at the end. Justified in that none of the craft have missiles, and their Fixed Forward Facing Weapons aren't very accurate over long distances. The heroes are in one large craft, with an additional turret, being attacked by several nimbler craft. In order to take one of them out, the pilot uses a real life tactic of taking the flight into vertical, where the smaller crafts' weaker engines die out before the larger craft's does, giving them plenty of opportunity to shoot down the assailant as they fall. The Last Starfighter has Ko-Dan fighters do this when battling Alex's Gunstar. The Gunstar itself has its weapons mounted on turrets and fights by simply plowing right through the enemy formation and blasting anything it can reach. Naturally, pretty much any movie about fighter pilots in World War I or World War II is probably going to have some of this. Hell's Angels and The Dawn Patrol are two films both made in 1930 about World War I aces; Hell's Angels is still famous for the exceptional aerial dogfight sequences directed by Howard Hughes himself. Wings, winner of the first Oscar for Best Picture, is a silent film also known for stunning aerial combat scenes. Only Old Men Are Going to Battle is a Russian film about Soviet fighters engaging the Germans on the Eastern Front that also has beautiful scenes of combat. Red Tails revolves around a squadron of African American fighter pilots during World War II proving that they are just as good as anyone else in U.S. Army Air Force. Naturally, this film features the eponymous Red Tail squadron's P-51 Mustangs squaring off against the best that the LuftWaffe has to throw at them, including the Me-109 and the Me-262. The "Air" section of Dunkirk has two RAF pilots dueling the Luftwaffe over the English Channel, trying to protect the Dunkirk evacuation. Hope and Glory: Has a dogfight as seen by a civilian from the ground. Billy stares up in fascination but all he can see is contrails looping around in the sky. Billy: You can't see what's happening! Done with a significant amount of artistic license in Top Gun: every action scene in the film involves jet fighters chasing each others' tails and trying to maneuver for advantage at close range like World War II-era prop planes (so much so that the hero, Maverick, gets caught in other planes' jetwash twice, leading to Goose's death when they have to eject from a powerless flat spin the first time). This was enforced by the filmmakers: at one point, at the insistence of the Navy pilots flying the actual planes, they tried filming period-accurate missile combat with the F-14s, A-4s and F-5s (the latter of which also stood in for the fictional MiG-28s), but that meant fighting at such long ranges that the other planes were practically invisible. The Star Wars Expanded Universe has a lot of this, reflecting the films, though different books and media vary considerably in how straight they play it. The X-Wing Series is a particular example, as it revolves around fighter pilots. The novelizations of the Robotech series address this problem by noting that the Veritech fighters were partially controlled by the pilot's thoughts. And since the pilots were accustomed to flying in the atmosphere, that translated to similar flying patterns in space. Whether this makes it better or worse is up for debate. The Gaunt's Ghosts spinoff Double Eagle, hyper advanced space fighters with vectored thrust engines and laser cannons are still mixing it up WWII style. On the other hand, mocked in Ciaphas Cain: Death or Glory along with See the Whites of Their Eyes: "Contrary to what you might see in an episode of Attack Run, footnote A popular holodrama of the 930s, about a squadron of fighter pilots in the Gothic War. starships in combat seldom approach to within point blank range of one another, exchanging fire at distances of hundreds, if not thousands, of kilometres." An Ork space fighter later attacks Cain's Escape Pod in the stereotypical style, but like most Orky silliness this is probably justified by their inborn Clap Your Hands If You Believe field allowing the fighter to do that. Played with for what little is seen of fighter combat in The Flight Engineer (the series revolves around a space carrier, but the hero is the fighter squadron's chief engineer instead of a pilot). Speeds chase each other's tails and loop around crazily and are armed with line-of-sight weapons, but the ranges are far greater than usual and, given the fact that capital ships avert Space Friction (they have to flip end-for-end and fire thrusters to stop), it's possible the Speeds were specifically designed that way. James White's Sector General series includes a story about the war that led to the series proper, as the humans and aliens were fighting close-up due to the alien Shield, which caused anything that would explode to do so at the edge, where energy beams would also dissipate. The humans managing to duplicate the Shield, left both species fighting in visual range, under the shields, with machine-guns, kinetic kill rockets and railguns. In Victoria, several of the air battles with Azania are portrayed this way, despite the setting's near-future technology. Justified in part, since they are fought among mountain peaks, where long-range weapons are realistically less useful; also downplayed, since fire-and-forget missiles are used, though under these conditions cannons still claim most of the casualties. Skyward: The humans often fight with the Krell this way, trading destructor lasers and dodging each other. Cobb, however, is extremely dismissive of this manner of fighting; Krell ships are faster, have stronger shields, and stronger destructors. He prefers to teach his cadets how to use the light-lances instead, which are basically energy grappling hooks. Bim: No lip intended, but... I mean, I talked to some cadets from Firestorm Flight this morning. They've been dogfighting this entire time. Cobb: Good for them! When they're all dead, you can move into their room. Dogfights, natch. Pretty much happens Once an Episode, especially during the episodes focused on World War I, World War II, and Korean War, where this type of fighting was the only sure way of downing aircraft. By the Vietnam War segments, American pilots are forced into going back to doing this, thanks in part to the flaws of early missile technology. Although Space Is an Ocean in the Star Trek franchise, there are occasional space battles that resemble dogfights more than naval battles, particularly as the budgets and special effects technology has increased. Later episodes and films show starships and starfighters alike banking, rolling, and chasing one another's tails — and not only that, but they fight at ranges comparable to WWII-era dogfights. Certain ships appear to be specifically designed for dogfighting; Klingon Birds-of-Prey and Jem'Hadar fighters, for example, only have Fixed Forward Facing Weapons, and while Federation capital ships can fire their phaser strips in nearly any direction the Defiant-class also has fixed phaser cannons that are more powerful than its strips. Farscape opens with John getting shot into the middle of an old school dogfight. The Stargate-verse has a few dogfights, and every race except the Asgard has at least one vehicle useful in a dogfight (F-302s, Death Gliders, Puddle Jumpers, Wraith Darts etc.). The F-302 and Death Gliders are hybrid aircraft that can also fight in atmosphere, which might excuse their aerodynamic design to some degree. Unfortunately this falls flat in light of Puddle-Jumpers and Darts, neither of which are all that aerodynamic, but both of which can not only fight in atmosphere, but travel through Stargates. The Goa'uld also invented a Stargate-traveling Death Glider at one point, but due to the difficulty of "threading the needle" only master pilots were able to use them for that purpose. The F-302 uses both modified Sidewinder missiles and rail guns as line-of-sight weapons. Against the death gliders they had enough missiles to get the job done, and only had to use the guns in some situations. By Stargate Atlantis episodes, however, against darts it's a different story since there are far more darts then there are F-302s. Used in pretty much every episode of Buck Rogers in the 25th Century. With the same stock footage almost every time. Space: Above and Beyond both plays this trope straight and averts it. The humans' SA-43 "Hammerhead" fighters would fly through space like conventional aircraft but, in combat, would twist and turn in ways that are only possible in zero gravity (this would go on to influence the reimagined Battlestar Galactica). Also, while they use cannons as their primary weapon rather than missiles, they have guns fitted fore and aft, and they're able to swivel. The interceptors in UFO use stand-off missiles, though they appear to be unguided. The combat in general draws very much from popular Battle of Britain images: Moonbase is the beleaguered sector airfield and SID (Space Intruder Detector) the RDF radar. Calmly-speaking young women (the WAAF's) vector in Interceptors (Spitfires) against the anonymous alien invaders (German bombers). But given that the Moon takes 27.322 days to orbit the Earth, one wonders why the aliens don't just attack when Moonbase is on the opposite side of their target. Doctor Who came up with an example of this trope taken to its extreme: through some Technobabble upgrades, 1940's Spitfires, with lasers, take on a Dalek ship in orbit (admittedly one that was incredibly badly damaged and couldn't really do much to fight back). This was, naturally, entirely down to Ruleof Cool. Babylon 5 and its spin-off Crusade play this straight. Even ships much larger than fighters can engage in such behavior, such as the White Stars, which are classified as gunships. Starfuries are notable in that they are shown several times to flip around while continuing to travel in the previous direction in order to shoot the target behind them. In fact, the Starfury design (a central pod with engines all around) is so good that it may serve as an inspiration for Real Life spacecraft. Soviet Storm: World War II in the East has the episode "The Air War", showcasing German and Soviet Ace Pilot/s, their planes, and their dogfights over the Eastern Front battlefield. The largest of which is arguably during the Battle of Kursk, where hundreds of Soviet fighters cover the ground forces against Luftwaffe fighters and bombers. Secret Service shows three Soviet MIGs shooting at American fighter jets escorting Air Force One. Invoked in Stern Pinball's Iron Man with the "Bogey" mode, which centers on Iron Man engaging two US Air Force fighter jets in an Old-School Dogfight. The Imperium has access to Skystrike missiles for air-to-air combat, and Tau seeker missiles give them a distinct edge over other races, but for the most part the game plays this trope straight. This trope is the entire purpose of the spinoff game Aeronautica Imperialis. The only guided missiles in the game are ground-attack-only weapons. Largely averted in the basic tabletop game; most fighters have Beyond Visual Range missiles (provided you believe the Units Not to Scale hand wave). Rules for dogfighting do exist in the 2013 version of Apocalypse, but they only kick in when two fighters get very close to each other, and the dogfight only lasts for one turn. This is the point of X-Wing Miniatures, to the point where only a handful of ships have the option to not move on their turn. Weapon ranges are fairly short, except on the Epic ships like the CR90 Corvette, meaning that you really need to be fairly close for maximum effect. Dropzone Commander relies heavily on countermeasures, mostly active such as ECM and CIWS, to keep the action on the table and justify the close-up urban combat, so even the most advanced aircraft are no longer capable of BVRAAM combat as it doesn't work well enough to warrant the capability. Back in the 1960s there was a game called Dogfight, with American pilots battling Germans in World War I. Many others have been published since then, covering every period from that war through the current day, plus sets of miniatures rules. Most go into at least some detail to distinguish different plane types. A number of combat flight simulator games featuring missile-armed jets fiddle with this trope. In JASF: Jane's Advanced Strike Fighters, for instance, some dogfighting skill is required, but you usually engage the enemy from several kilometers away. Most kills will come as you close with other planes, but regardless of how you kill you can only get a missile lock when the enemy is ahead of you. The Ace Combat series Zig-Zags this trope; on the one hand, the player character's plane is typically armed with dozens or even hundreds of missiles that they can use to blow away mooks by the hundred, but only at absurdly short ranges, and ace pilots or Boss Battles generally will require some old school dogfighting to take down. Tom Clancy's H.A.W.X. uses the Ace Combat model for the most part and even forces you to guns only at one point (handwaved by a malfunction in your squadron's missile targeting systems). It also features a mechanic where you can turn off your plane's stall-prevention systems, enabling you to do such things as flipping end-for-end to blast a guy behind you. 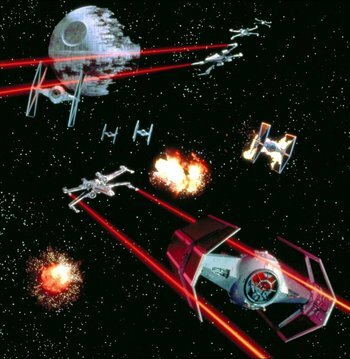 Star Wars games, as in the rest of the franchise, make extensive use of old school dogfighting. A-gears in Siege Mode are capable of killing at extreme distances due to the volume of firepower they're capable of putting out. However, their weapons have a minimum range on their weapons (which is affected by their armor), meaning that the best way to kill them is to — you guessed it — old school dogfight. B-gears are able to rain death from the very top of the battlefield. However, they're often used instead as a battering ram in nation war events, in which they attempt to destroy defenders pouring weapons fire into a zone gate with an Action Bomb that takes out nearby gears. I-gears have amazing maximum lock-on range with their missiles, but it's also harder to lock on to the desired target from extreme range if said target is surrounded by clouds of sacrificial decoy craft. In Critical Mass (1995), your squad does indeed have guided missiles, but the ships often turn faster than the missiles do. Add this to the fact that a lot of ships are equipped with the powerful but unguided Plectron rocket, and you get old school dogfighting. X-Universe: Used like pretty much everything else set in space. X3: Reunion is a particularly egregious offender, as it advertised a Newtonian physics model but then still went with the constant thrust = constant speed model. Most medium to heavy missiles are not only easily shot down by guns, but are actually slower than their intended targets. Arguably a response to Artificial Stupidity, as the missiles are prone to Roboteching and there's no such thing as countermeasures. Star Fox is built on this trope, which shouldn't be surprising since the ships used are basically just the X-wings from Star Wars. Levels take place in open space, near the ground, or even near the surface of a sun, but the handling is always exactly the same. Halo: Reach has a Wing Commander-style space dogfight in a Sabre fighter during the mission "Long Night of Solace", armed with machine guns and barrages of homing missiles. Several levels in the Halo franchise also have Banshee dogfighting, where they handle the same regardless of whether they're on Earth, a Halo ring, a gas giant, or in space. In Tachyon: The Fringe, all engagements are done at extremely close ranges, and standard tactics involve chasing the enemy until your have him in your crosshairs for a (slow) laser barrage. While there are missile weapons, they are limited, can be fooled with cheap countermeasures, and only those provided by GalSpan are guided. Fighters can "glide", though, disengaging engines and rotating the craft to face and fire in any direction. It can also be used creatively with the afterburner to go past the normal max speed (but only in a given direction). The Aquanox games do this underwater. While you nominally pilot a submarine, it looks and behaves like a Space Fighter with Space Is Air, er, Water Is Air, in full effect. Mass Effect is inconsistent about using this and averting it. The codex discussion on space combat tactics says that it's normally averted, with standard fighter tactics being to attack using guided missiles at ranges of tens of kilometers or more. Background events in the game itself show battles more typical of this trope, however — but it can be argued that those events are the exception to the rule, being "knife fight" (the term used by the in-game codex) engagements at horrifically short ranges where most of the normal rules of fleet combat don't apply. Justified in the Climactic Space battle at the end of Mass Effect 3, because the situation really is that desperate. Zigzagged in The Babylon Project, a freeware Babylon 5 game built with the FreeSpace 2 engine. TBP uses the stereotypical Space Is Air dogfighting physics for the most part (fixed weapons, Chasing Your Tail, etc.). However, in keeping with their TV show counterparts' behavior, Starfuries also have a "glide" mode that lets them rotate while continuing on their original vector. In UFO Defense and Enemy Unknown, your Interceptors (cutting-edge fighter craft) are implicitly dodging lasers and plugging enemy UFOs with missiles before they get shot down themselves. In practice however, the map screen in UFO Defense is so large that you can park a fighter in one spot, or even squat on a landed UFO until it blasts off again, and wait to engage them. X-COM: Interceptor has this in full effect. When engaging alien fighters in the Battlescape, you pilot one of the fighters, while your wingmen are AI-controlled. Both you and the aliens engage in this trope with energy weapons being the main armament, although all fighters can also mount missiles. All three human-made fighters look like they might be capable of atmospheric flight as well, at least by the fact that they have wings. The first one is called the X-1A "Lightning" II, even though it looks absolutely nothing like the original "Lightning" from the first game (but looks weirdly similar to the X-301 from Stargate SG-1). The S-2 "Firestar" looks like it has curved blades for wings with orange flames painted on the front. The M-3 "Super Avenger" looks like a more rigid version of the X-1A, even though all three fighters were developed by different companies (Transtellar, Super Dynamics, Marsec). XCOM: Enemy Unknown depicts UFO interception this way, with your launched fighters closing with the UFO from behind and trading fire with it. Given that you're essentially watching a simplified version of events on an in-game monitor rather than seeing the actual action, though, it's not entirely clear whether the trope is "really" in effect. If so, it is a justified example though, as the UFO is going about its own mission, and the interceptor is trying to shoot it down as it attempts to outrun the human craft, firing backwards down its axis of movement to discourage it. Justified in Sid Meiers Ace Patrol, which takes place during World War I. The unique part comes from the fact that the game is turn-based. During missions, you have 1-4 fighters under your control, and you give them orders in the form of various arrows on a hex-grid. Pilots level up with kills and can learn new maneuvers (e.g. loops, slides). Some fighters also have rear-mounted turrets. The sequel Sid Meier's Ace Patrol: Pacific Skies moves the action to the Pacific theater of World War II. Naturally, fighters are more advanced. Both averted and played straight in Star Control. Trying to get behind ships is generally a poor strategy as they can turn around and fire back (their angular and translational velocity are separate), and the weapons of the ship being chased will have greater relative range. However it's played straight in that the majority of ships only have a Fixed Forward-Facing Weapon, thus necessitating maneuvers like turning around, and producing some standard dogfight tactics. Freelancer (a supposed sequel of Starlancer, although there are no similarities beyond a mention of the war in the intro) mostly plays this straight, even with the fact that all weapons are turreted and can fire in a limited arc that doesn't match the direction of the fighter. Heavier ships like transports as well as some larger fighters can mount full turrets that fire both forward and back, but that makes maneuvering trickier. The iOS Galaxy on Fire games are also a good example. Some higher-end ship designs also allow a turret to be mounted that can fire in any visible direction (i.e. can't fire through the fighter) and some turrets can be set to automatically target and fire. Star Trek Online plays this trope back and forth. While there's a lot of customization options for ships, the tactically-oriented ships play this trope straight as they tend towards more powerful cannons whereas the less agile tanking-oriented ships tend to use arrays that lend themselves more to broadside attacks and ends up being more Space Is an Ocean. There's quite a bit of customization possible with ships to match play style so it's not a hard and fast distinction. The post-Delta Rising period encourages this further with the addition of the "flanking" mechanic, which grants damage bonuses for attacking from the rear to "raider" ships (mainly Klingon birds-of-prey) and captains who take the Intelligence specialization. Star Trek: Armada plays this straight with most ships but there's a notable aversion. The Steamrunner class was designed for long-distance, wide-area bombardment rather than dogfighting. In the Red Baron series, the background setting is actually the oldest of the old schools in question — World War I — when aerial combat was in its infancy and the only weapons one aircraft could use against another effectively was the machine gun. Hence, close-range dogfights between aircraft are extremely common. Wing War has the "Dogfight" mode, which leads to this trope. Both players change phases periodically. Most ship vs. ship combat in No Man's Sky are these, both in space and in atmosphere. Airfix Dogfighter slightly subverts this; you still have to have your target more or less in the center of your view in order to shoot at them, but the game will automatically aim the crosshair at the target as soon as they're within range. Happens frequently in Ratchet & Clank games, such as Going Commando, Tools of Destruction, and A Crack in Time, which all featured space combat. MechWarrior Living Legends, set in the BattleTech universe in ~3068, features fusion reactor-powered pulsed laser-toting Space Planes that have roughly the same level of radar sophistication of a early-mid 1960s jet fighter and speeds analogous to an late 1930s monoplane.note This is for gameplay reasons, as going faster basically breaks the game's netcode. Fighters in the source material are easily capable of mach 1 and reaching orbit on their own power. Most fighting takes place at sub-300 meters, with players trying to get on each other's tail to open up on their engines or fuselage. "Long" range missiles exist (1000-1300 meters), but they can only lock on when flying and aiming towards the target, and they're highly unreliable at hitting anything not flying directly to or away from the user. Aircraft are functionally identical in all environments, be in air, space, or funnily enough, water, the only variable being how easy or hard it is to overheat, based on the ambient temperature. Sabre Ace: Conflict Over Korea features this, as it takes place during the Korean War, after the introduction of jet fighters but before air-to-air missiles. Every flyable plane, and most of the ones that aren't, uses fixed forward-facing machine guns and/or cannons as its primary air-to-air weapon. Crimson Dark has space fighters and bombers which act like planes. Angels 2200 is about the pilots of carrier-based space fighters which look and fly like planes. A dogfight between Resistance fighters guarding the evacuation of the base and a UEC fighter squadron attacking it (including Alex and Rick) takes up the majority of chapter three of Terra. The two sides are armed with both missiles and guns but engage air-to-air with guns only. tinyraygun opens with Nepta's ship being pursued by ships that seem only capable of firing at near point-blank range. Old school dogfighting was one of the primary forms of air-to-air combatnote The other was using Hit-and-Run Tactics to ambush an enemy plane, riddle it with bullets as you flew past it at high speed, then be out of range before your target could respond up until the development of BVR (beyond visual range) and all-aspect (capable of hitting a target at any angle, not just one that's in front of you) missiles. Despite advances in technology, however, old school dogfighting never entirely disappeared. There was a period in the early 1960s where dogfighting was briefly considered obsolete, and planes (notably the American F-4 Phantom) were designed with missiles as their only weapon. The Vietnam war demonstrated the problems with this approach, and pretty much every plane designed for air-to-air combat since then has planned for dogfighting to some extent. As an analogy, dogfighting for pilots is like hand-to-hand combat for infantry: an Archaic Weapon for an Advanced Age. It's no longer considered the primary form of combat, and you don't really expect to use it on anything like a regular basis, but you still have to train for it, because if you don't, your enemies will use that against you. Averted (for a couple of days, anyway) by the Boulton Paul Defiant during the Battle of Britain. A German fighter would get on its tail and be blown out of the air by the four guns in the Defiant's rear turret. Then the Germans discovered the Defiant had no forward-firing armament, and was both slower and less maneuverable than conventional fighters and thus could do little to evade them.